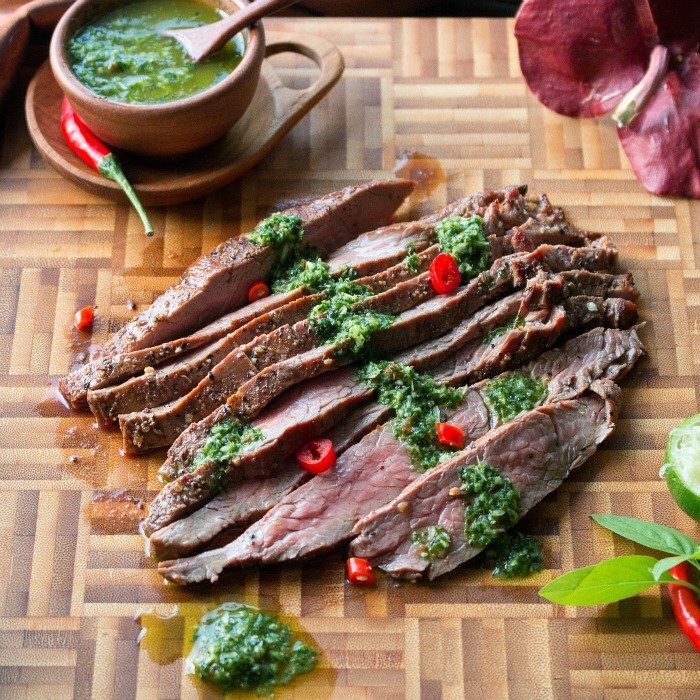 Grilled flank steak with Thai style chimichurri is going to be your new favorite under 30 minute meal with a sauce of chilis, garlic, lemongrass, olive oil and plenty of coriander, Thai basil and a drizzle of fresh lime. 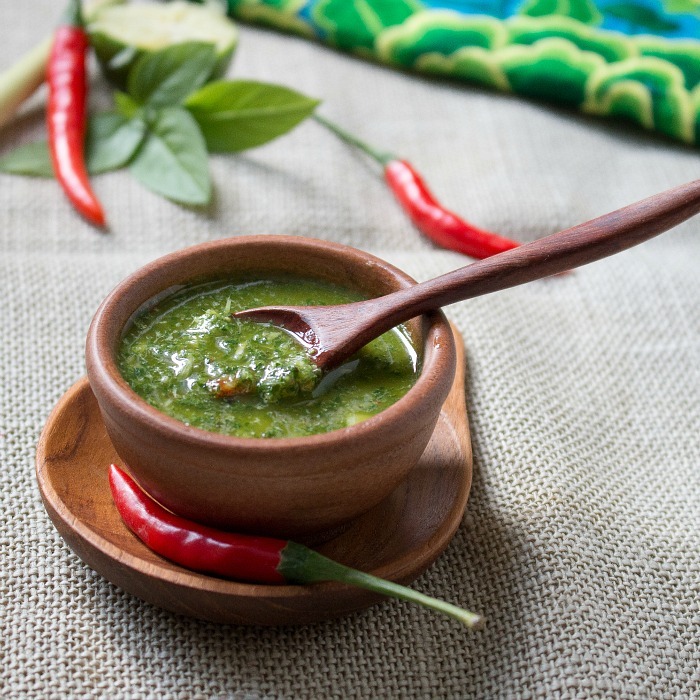 Lip smacking and oh so good this delicious Thai Style chimichurri sauce was great on steak but would also be good on fish, lamb, or even on your morning omelet. Trust me...you are going to want to make extra sauce as it is so good and I have been putting it on almost everything this week. 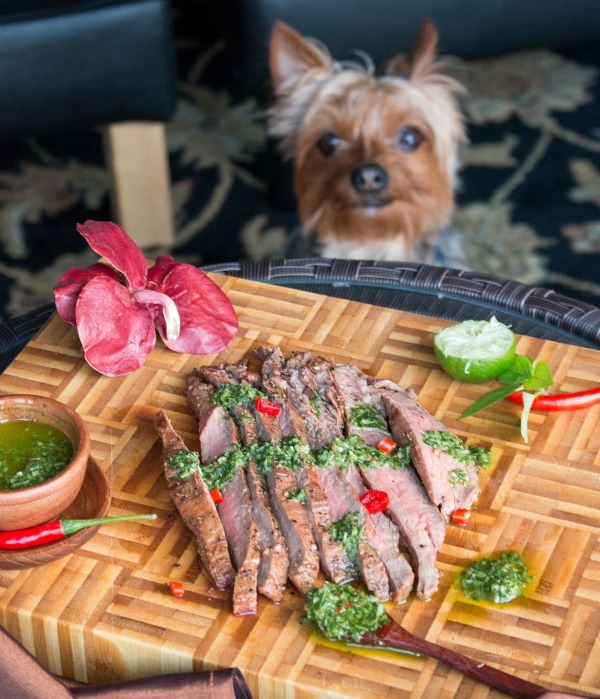 My inspiration for making Grilled Flank Steak with Thai Style Chimichurri came a few weeks ago after I spent a long weekend browsing over some Thai cookbooks. I have made steaks on many occasions with a delicious Argentinean chimichurri sauce but how about a THAI Style Chimcihurri sauce. I wanted to create traditional Argentinean chimichurri sauce back in Bam's Kitchen. I have my own little herbs and spices growing on my window seal with loads of fresh coriander, Thai basil, fresh limes, chilis and lemongrass in my crisper. If I can't be in Thailand, at least I can bring Thailand to Hong Kong and then this Thai Style Chimichurri sauce was born. If you have a food processor, making the Thai styled chimichurri sauce could not be easier. Even if you are not in Asia, you can certainly make this delicious sauce with a few exchanges if you do not have access to an Asian market near you. I started out with fresh Coriander (cilantro roots and all), fresh Thai basil (you can exchange with regular Italian basil if living in the Western world), olive oil for richness, garlic, fresh chili for a little heat (or a dash of red pepper flakes), fresh lemongrass (or lemon grass paste or dried ground lemon grass) for aromatics, salt and pepper to taste, lime for a fresh sparkle. Whiz it up and the magic green Thai Chimichurri sauce is done. "Hey did someone ring the dinner bell? That was so kind of my master to leave that whole tray of beef just for me." When I lived in Michigan, I grilled outside all year around. It was about this time of the year that I would plow a little one lane snow shoveled lane out to the gas grill. 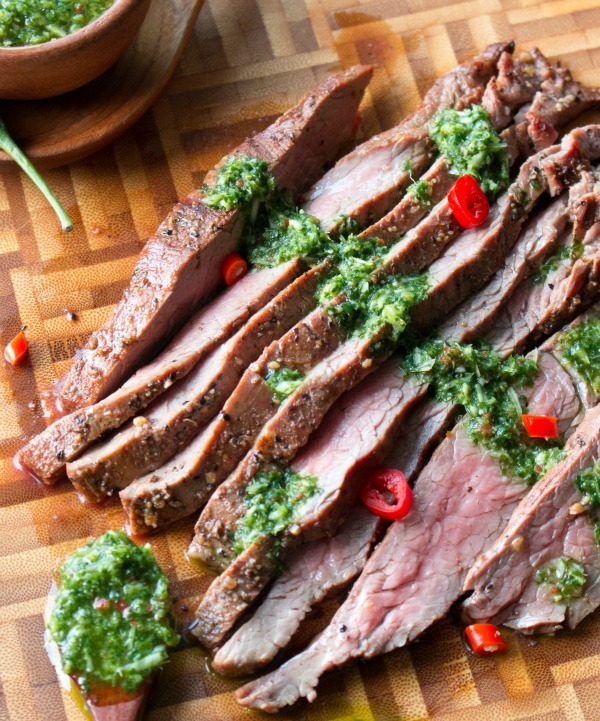 I cannot think of a better way to let mother nature know who is boss than to rule over the grill with this mouth-watering Grilled Flank Steak with Thai Style Chimichurri. However if you are a bunch of fair weather only grillers, you can also grill up a lovely steak in your grill pan inside your warm house or fry one up Gordon Ramsey style in your iron skillet. You can use any cut of steak you desire but if you decide to use a flank steak ( a tougher inexpensive cut of meat) than you must marinate it at least 1 hour or best overnight to tenderize and give maximum flavor. Bringing the flank steak to room temperature before grilling, not adding the salt until the grilling process, only cooking to medium rare and allowing the flank steak to rest for 5 minutes before slicing really thin are all important steps for creating a tender and delicious steak. 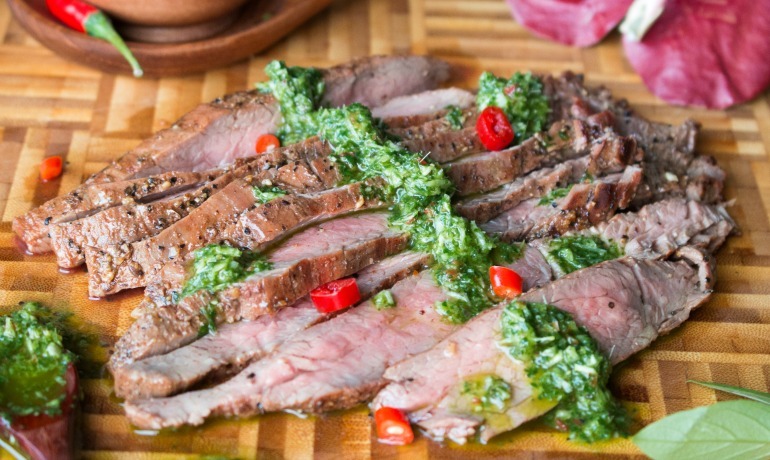 I hope you enjoy this quick and easy grilled flank steak with Thai style chimichurri dinner as you can have it on your table in less than 30 minutes, its low carb, gluten-free, diabetic friendly and a delicious Asian fusion dish. 2Take your steak out of the refrigerator to come to room temperature, about a half hour before you are ready to grill your steak. 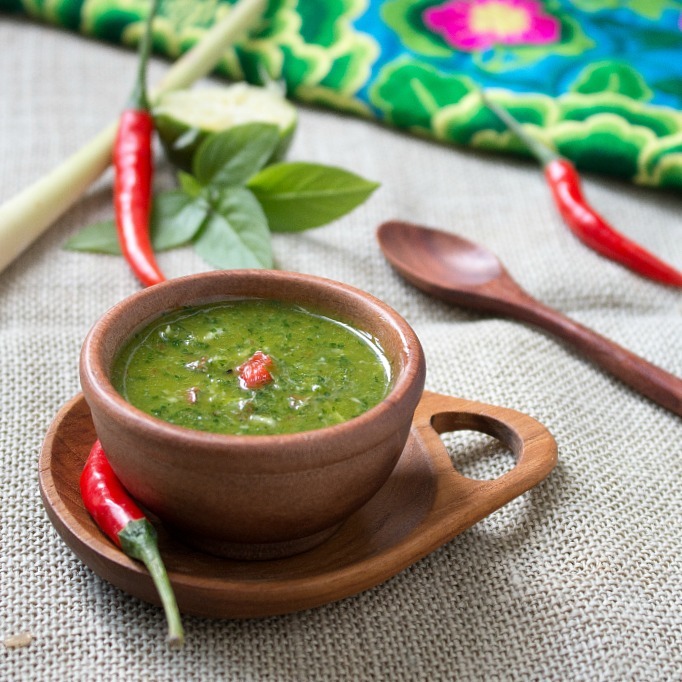 3Make your Thai Style Chimichurri sauce. In your food processor, add garlic, lemongrass, chili, Thai basil, cilantro (coriander roots and all), lime juice, olive oil and salt and pepper to taste. Blend until smooth, adjust seasoning as desired. 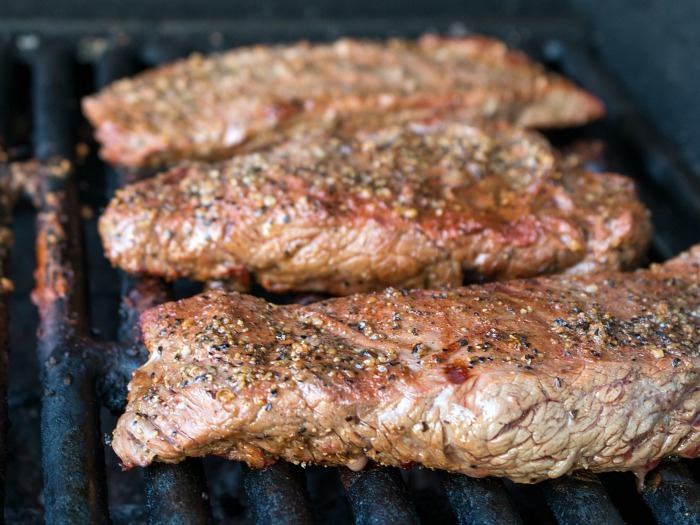 4Step 4 : Grill flank steaks. Grill flank steaks until medium rare or about 6 minutes per side. Salt and pepper steaks during the grilling process on each side and also slather steaks with some of the Thai Style chimichurri sauce. 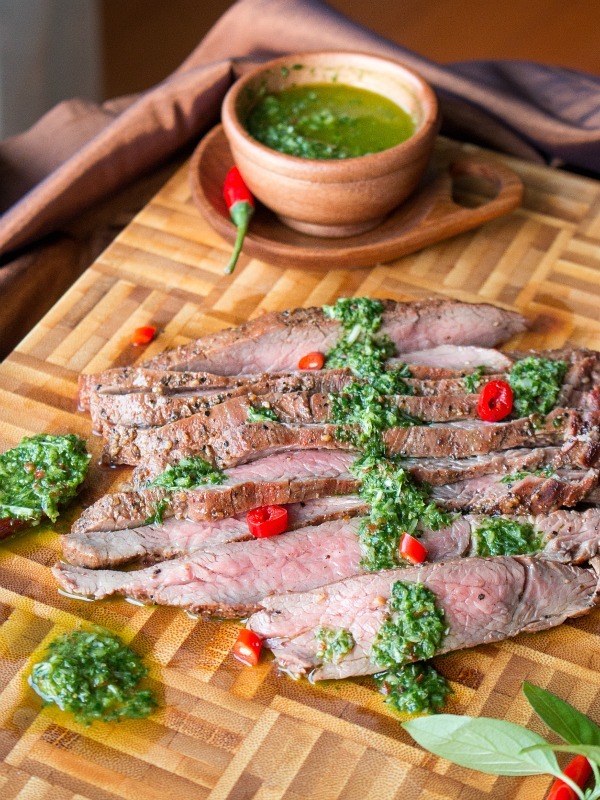 Reserve half of the Thai Style chimichurri for serving on the side and dipping the steak. Let your flank steak rest covered for about 5 minutes. Slice against the grain thin. 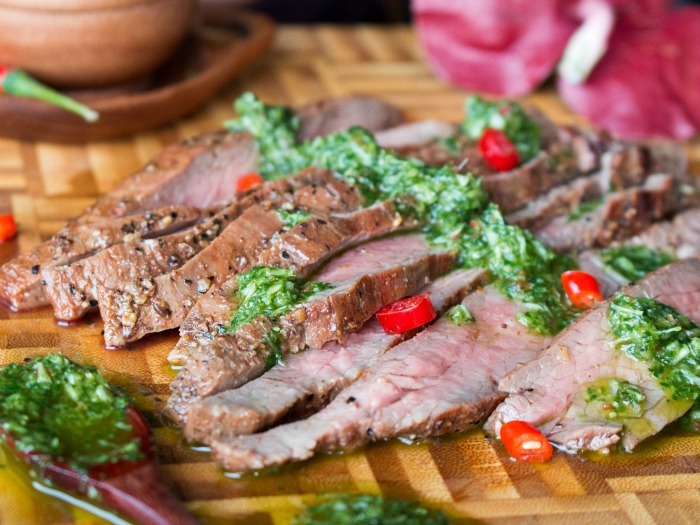 5Serve slices of Grilled Flank Steak with Thai Style Chimichurri sauce on the side for dipping. Enjoy!